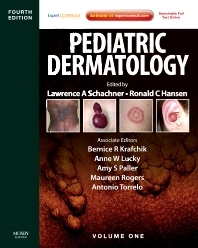 The latest edition of Pediatric Dermatology, edited by Lawrence A. Schachner, MD and Ronald C. Hansen, MD brings you the detailed guidance you need to effectively diagnose and treat pediatric skin conditions. Review topics from keratinization to stem cell therapy, and gain expert guidance from international contributors. Now in a comprehensive two-volume format with 40% all new clinical photos and full-text online access, this resource is ideal for clinical practice. Review updates covering the latest drug treatments, newly reported drug reactions, and much more. . Refer to full-color photographs in print and online that accurately capture the appearance of a wide range of skin disorders. Access many new tables and therapeutic algorithms for at-a-glance guidance.